Much has been written about the various symbols of Reiki. The theory of almost everything that one needs to know is available aplenty in the form of books as well as the Internet. But what is not available so easily is the “inner knowledge” that comes only with diligent practice. It is this very reason that many people are not able to achieve the results that they expect – because they have not practiced sufficiently and all their theoretical knowledge is actually of no use when it comes to energy healing. 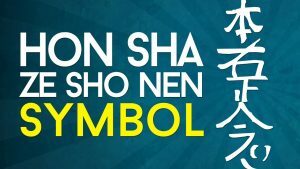 Therefore let me dwell a bit about what “Hon-Sha-Ze-Sho-Nen” – the 3rd symbol of Usui Reiki is all about. To those who have been attuned in the second level of Reiki, this is often explained how it is drawn and pronounced. For those who practice it merely as a ritual, it is something that will help in making a connection between you and the person who is going to receive Reiki; but for a true practitioner of Reiki, it is the key to their entire practice. YES!! you have expressed so well what I’ve always “felt” about this symbol. thank you for putting it into words!